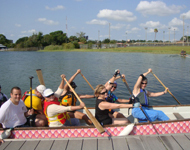 Unleash Your Inner Dragon Boat Warrior! No experience is necessary! If you are 14 years or older, and have never paddled with us, we invite you to join us for a free, complimentary practice. Please note: If you are new to the sport and have never participated in dragon boating, we ask that you first join us for a “Check us out for free” and “Learn to Paddle” You can then join the club and can participate in any of our scheduled club practices. In order to schedule your first practice with us, please sign up on Meetup.com or contact Joe or for more information and assistance on signing up. A link to our current practice calendar and schedule is available at Dragon Boat Calendar. Please note: Practices labeled “DBC” are our open, club practices that are available to all paddlers. You will need to complete our waivers by downloading, printing, and filling out the ORC Dragon Boat Club Waivers. Please bring these waivers with you to your first practice. Please arrive 30 minutes prior to your first practice. Practices are one hour (but sometimes go over a few minutes). For future practices, beyond your first practice, we suggest that you arrive 15 mins prior to practice, in order to stretch before getting on the boat. What to wear? You’ll want to wear comfortable clothing (such as “work-out” clothes–t-shirt, shorts, etc.) and a hat and sunscreen, especially if you are susceptible to the sun. Water shoes or tennis shoes are recommended, as you may get splashed. Leave your valuables in your glove compartment or trunk. Important!! Please bring a bottle of water (you can bring your water on the boat with you). PFD’s and paddles are provided. The practice captain will help you find your correct paddle size. 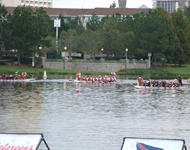 If you are new to dragon boating, here is a helpful list of Common Dragon Boat Commands. If you enjoy your first practice, you can join the club and sign up for future practices. Memberships provide you with the opportunity to attend as many club practices as you want.